Citrus originated in Southeast Asia, not Southeast of Orlando. Strawberries came from a chance genetic mix between a plant from the Mid-Atlantic States and a plant from Chile that crossed in France. Tomatoes originated in the Andes Mountains in South America, then made their way to Europe before coming back across the Atlantic to North America. Every Florida-grown crop has a long history, and just about all of them have nothing to do with Florida, at least until landing here in recent times. Over the last century, farmers and scientists have discovered ways to adapt various species to perform well in Florida’s challenging weather and pest-ridden climate. Innovations in crop genetics — on purpose or by accident — provide the Southeast U.S. farmer with a profitable counter-season market of high-value specialty crops. But what about native plants? Certainly indigenous people lived off the plants that grew in Florida naturally. The answer is a simple one: Highly productive crop plants arose from places where populations were dense. In these population centers, many farmers actively examined differences in individual plants that led to increased value as food crops. The glacial process of breeding and selection slowly changed wild weeds and shrubs into delectable, modern-day fruits and vegetables. The plants that naturally reside in Florida’s wild soils are hearty stock that seem to ignore the brutal heat of summer, the salt of the shores, and the insects and nematodes that make short work of cultivated varieties. But do they have potential value as the next generation of Florida fruit and vegetable crops? The answers might come from a couple of books and manuals that were written years ago. In 1944–1946, Richard Howard was the chief of the survival section of the U.S. Air Force Tactical Center in Orlando, Florida. At the time, there was widespread concern about surviving a military attack. Being able to locate sufficient food was part of every survival plan. Howard devised a manual from documenting his experience of going out and preparing and tasting Florida’s native vegetation. In 1961, Julia Morton published “Wild Plants for Survival in South Florida” in the journal of the Florida State Horticultural Society. She shared Howard’s concern that evacuation from urban areas in a time of civil defense might spur the need to forage for food in Floridian forests. 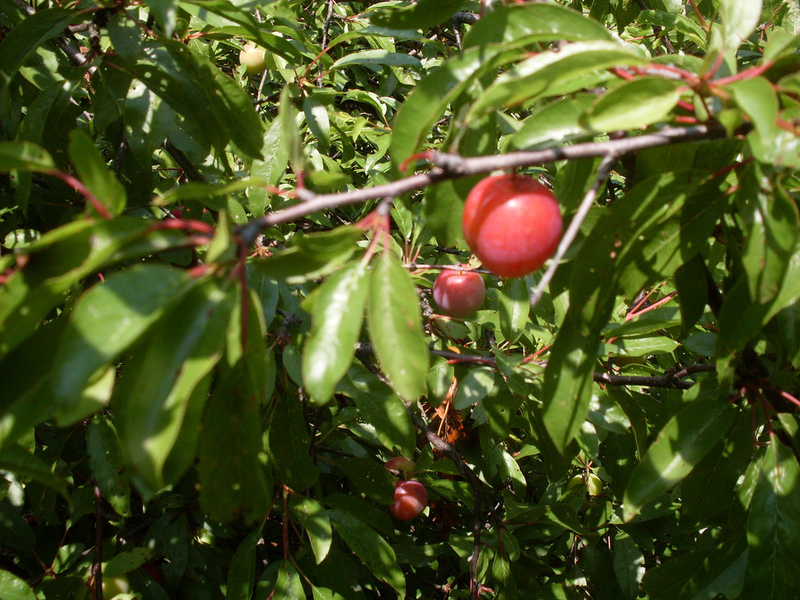 The Chickasaw plum is one of several plum species that grows well in the American Southeast. Together, publications point out that there are many plant species that naturally thrive in Florida soil and have potential food value. Is it possible that these plants might be a few generations away from domestication and even propagation as exciting new types of fruits and vegetables? Their resilience against native pests and pathogens, weather extremes and hungry herbivores suggest that they might be good candidates for future farms. Blueberries are a great example of what can happen when skilled plant breeders marry native plants to non-native varieties. While Northern Highbush blueberries were a product of states north of Florida, wild relatives with tiny berries are present along rivers and in forests in Florida. When hybridized to the Northern Highbush, the progeny gave rise to the Southern Highbush varieties that contribute to Florida’s modern agricultural economy. Some of the future candidates are pretty exciting. Physalis species, husked berries related to tomatoes, have a range of flavors and aromas and many species grow well in Florida’s climate and challenging soils. in the sun, breaking down internal toxic compounds. These trees naturally occur in the Southeast United States and could serve as starting material to breed against elite stone fruit lines. 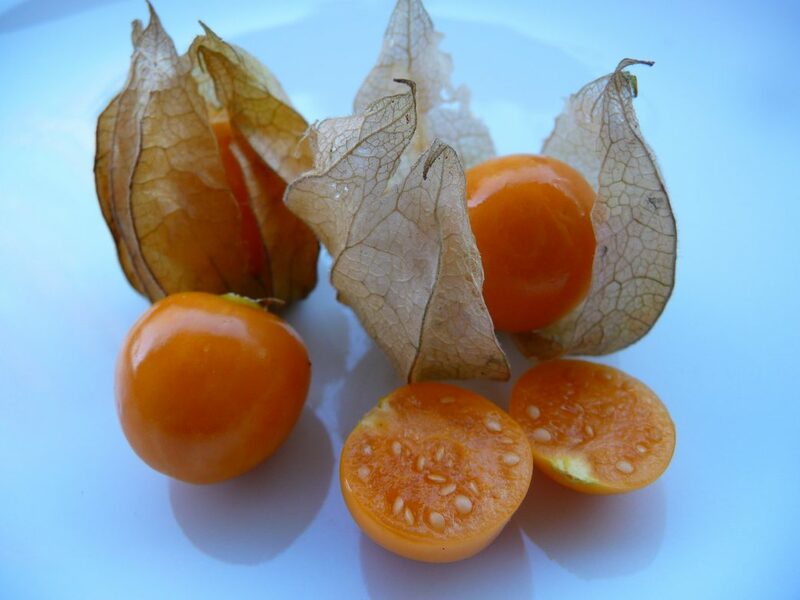 Another great native plant example is the ground cherry (Physalis spp.). There are nine species of this plant in Florida, which are all tiny tomato-like berries that grow in a husk on a short plant. Ground cherries are related to tomatoes and resemble the tomatillo in appearance. These plants do well in Florida soils and could be a few generations away from being featured in salads. Ground cherries are salt tolerant, grow well in dry sand and have natural resistance to insects, nematodes and disease. This means they may require few fertilizers or chemical treatments to grow well in Florida. The sea grape is a fruit that grows on a tall tree that is resistant to heat, drought, salt and shade. The fruits may be eaten raw or as jellies or preserves. The tree is found in warm, coastal areas in Florida and throughout the Caribbean. Meadow garlic (Allium canadense) and striped garlic (Allium cuthbertii) dot open fields throughout Florida. They may be only a few generations away from the grocery store shelves. 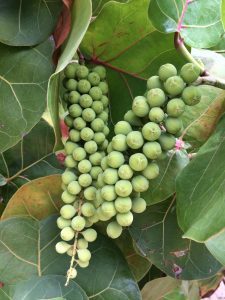 Sea grape (Coccoloba uvifera), cocoplum (Chrysobalanus icaco) and mangrove berry (Mosiera longipes) thrive in poor coastal soils and bear edible fruits that may be productive in frost-free regions of the state. These are just a few examples of plants that might be future crops, with a little help from science. In a time when consumers want something unusual yet local, native fruits and vegetables might offer appeal. These varieties may help farmers in the Southeast diversify their acreage with new crops — all derived from plant species that naturally belong in Florida soils. Kevin M. Folta is a professor and chairman of the Horticultural Sciences Department at the University of Florida in Gainesville.